Hamilton Island Air adheres to a strict cancellation policy. If you have any questions with regards to this cancellation policy, please feel free to contact us. All credit card bookings will be pre-authorised 24 hours prior to departure. If your credit card is declined and we are unable to contact you, your booking will automatically be cancelled. All prices are per person and valid for travel until the 31st March 2020. Please bring your own towels, sunscreen and children’s toys. Minimum passenger/booking numbers apply to all Tours and Transfers, helicopters 2 persons, seaplanes and aeroplanes 4 persons. The third person discount only applies to the same group booking in our R44 aircraft. For legal and safety reasons all passengers are weighed prior to boarding – individual weights in excess of 110kg will incur an extra seat surcharge. Combined body weights per two passengers booking’s in excess of 180 kg’s will incur an extra seat surcharge. Maximum allowable per seat weight is 130 kg’s. 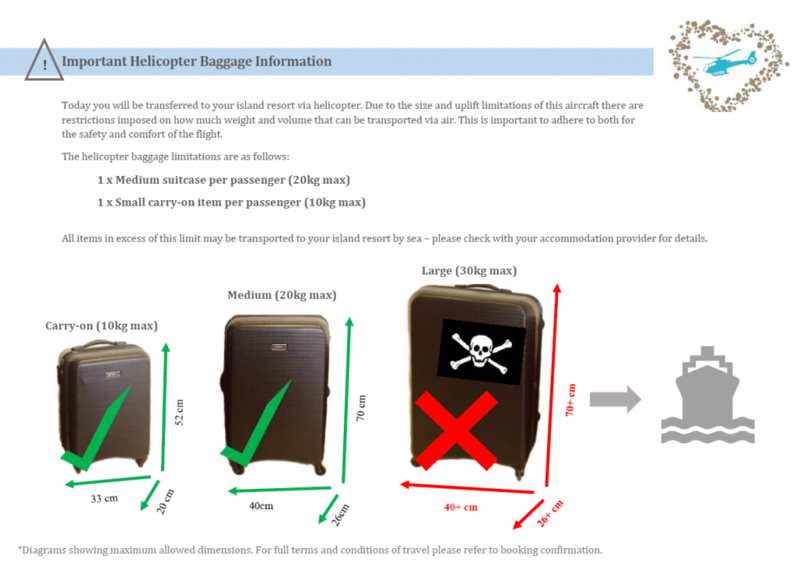 Luggage restrictions apply to all Transfers, Helicopters, 1 medium size suitcase not weighing more than 20kgs and 1 standard test cell size carry-on bag not weighing more than 10kgs per person. Seaplanes, 1 standard test cell size carry-on bag not weighing more than 10 kg’s per person. Touring luggage restriction, 1 soft bag not weighing more than 5kg’s p/p. Single seats are available on a standby basis at 6pm day prior to travel only. All tours and transfers are available on a Private Basis for an additional charge. Privacy is not guaranteed on any Tour or Transfer unless privacy has been requested and the privacy surcharge has been paid. Infants are welcome and are carried at the discretion of Hamilton Island Air; however, our tours are designed predominantly to accommodate adults. Some Tours are not suitable for infants, if in doubt please ask. Infants are classified as 0-2 years, one infant may travel free of charge on a parents lap in the rear of the aircraft. Please note that only one infant may travel FOC per aircraft, two infants may occupy 1 seat, the seat price applies. Children are classified as 3 – 13 years of age inclusive, must be accompanied by an adult on the flight. Due to the nature of Seaplane operations all flights are operated at the discretion of Hamilton Island Air. Flights are subject to changeable weather conditions including tidal, sea state , prevailing winds, air traffic control, unscheduled maintenance and other influences outside of our control. In the event of inclement weather and we are unable to operate the tour or transfer for any reason, subject to availability Hamilton Island Air will ensure that guests are offered an alternative destination and/or transferred on the next available window in which the transfer or tour can proceed safely. Both The Reef Comber tour via seaplane and the Journey to Heart via helicopter tours are NOT suitable for non-swimmers or children 0-13, no life guard is on duty. If you can not swim you will NOT be permitted to enter the sea under any circumstances. HI-AIR will not be held liable for costs associated with airfares, accommodation or anything else due to any flight on any aircraft type which does not proceed as booked or confirmed. HI-AIR will not be held responsible for inclement weather, sea state, waves, sunburn, sunstroke, insect infestations or for any other creature which may bite, sting or eat you whilst you are visiting their habitat. During stinger season (Oct-May inclusive) passengers enter the ocean at their own risk. All flights and flight paths are subject to prevailing weather, tidal conditions and availability; therefore itineraries are subject to change without notice. Cancellation fees apply for all bookings cancelled between 12 and 24 hours prior to departure, all no shows or cancelations on the day of travel – 100% cancelation fee applies, this includes all Reefworld scenic flights. Aircraft seat configuration is determined by the aircraft manufacturer; therefor we can not guarantee window seats. Hamilton Island Air is a licensed Civil Aviation Safety Authority (CASA) certified carrier, flights are operated by Whitsunday Air Services Pty Ltd AOC# 1-KPVQ0 -06. Prices are stated in Australian dollars and include GST and the Environmental Management Charge (EMC). Tour times are an approximate indication only. For credit card booking’s your card will be pre-authorised in line with our cancelation policy and then charged on the day of travel. Hamilton Island Air accepts Visa, MasterCard and American Express (American Express attracts a 3.85% surcharge). All information was correct at the time of print. Tours and prices are subject to change without notice. Hamilton Island Air offers helicopter, seaplane and aeroplane tours throughout the Whitsundays, Great Barrier Reef and Hamilton Island area. Our luxurious tours can include scenic flights, helicopter transfers, reef cruises, snorkelling, beach picnics and more. Book Online for the experience of a lifetime.